Donald Trump tore into civil rights legend John Lewis for questioning the legitimacy of the Republican billionaire's White House victory, intensifying a feud with the black congressman days before the national holiday honoring Martin Luther King Jr. and as the first African-American president prepares to leave office. Trump tweeted on Saturday that Lewis, D-Ga., "should spend more time on fixing and helping his district, which is in horrible shape and falling apart (not to mention crime infested) rather than falsely complaining about the election results." The incoming president added: "All talk, talk, talk - no action or results. Sad!" For many African-Americans the contrast between this inauguration and Barack Obama's first one, in 2009, was striking. The 16-term congressman said Friday that he would not attend Trump's swearing-in ceremony at the Capitol this coming Friday, and that it would be the first time he had skipped an inauguration since joining Congress three decades ago. "You know, I believe in forgiveness. I believe in trying to work with people. It will be hard. It's going to be very difficult. I don't see this president-elect as a legitimate president," Lewis said in an interview with NBC's "Meet the Press" that is set to air Sunday. "I think the Russians participated in helping this man get elected. And they helped destroy the candidacy of Hillary Clinton," Lewis said. Lewis' spokeswoman, Brenda Jones, declined to respond to Trump and said the lawmaker's "opinion speaks for itself." "We as a nation do need to know whether a foreign government influenced our election," she said. U.S. intelligence agencies have said that Russia, in a campaign ordered by President Vladimir Putin, meddled in the election to help Trump win. After spending weeks challenging that assessment, Trump finally accepted that the Russians were behind the election-year hacking of Democrats. But he also emphasized that "there was absolutely no effect on the outcome of the election including the fact that there was no tampering whatsoever with voting machines." 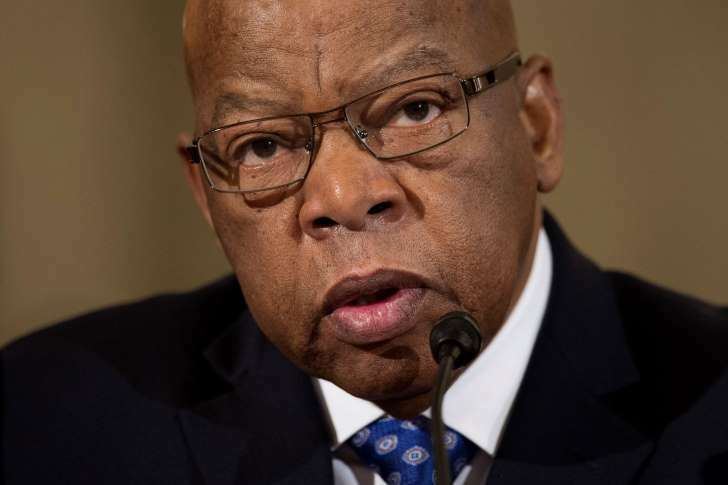 Lewis' Democratic colleagues quickly came to his defense Saturday. "Let us remember that many have tried to silence @repjohnlewis over the years. All have failed," tweeted House Minority Leader Nancy Pelosi, D-Calif. The Democratic Party of Georgia called on Trump to apologize to Lewis and the people of his district. "It is disheartening that Trump would rather sing the praises of Vladimir Putin than Georgia's own living social justice legend and civil rights icon," state party spokesman Michael Smith said. Trump continues to use Twitter to attack his adversaries, just as he did throughout the campaign. Trump's assertion that Lewis' district is "falling apart" and "crime infested" is hard to prove. Georgia's 5th Congressional District includes the Atlanta metro region, which has a large African-American population. The district is considered one of the nation's fastest growing areas, but its crime and poverty rates are higher than the national average. The district has an 8.2 percent unemployment rate and the median household income is about $48,000, according to the Census Bureau. The area also covers part of the upscale Atlanta neighborhood of Buckhead, along with the headquarters for Fortune 500 companies such Coca-Cola and Delta Air Lines, Emory University, Georgia Tech, several historically black colleges and universities and the Hartsfield-Jackson Atlanta International Airport, one of the world's busiest. A growing number of Democrats, Hollywood celebrities and some Republicans came to the defense of civil rights leader Rep. John Lewis amid fallout from Donald Trump's comments earlier on Saturday. Trump said that Lewis, who has argued the president-elect won't be a legitimate leader, should focus more on fixing his Georgia district. The response on Twitter was swift. GOP Sen. Ben Sassse of Nebraska tweeted that "John Lewis and his "talk" have changed the world." Residents of Lewis' district in Atlanta, meanwhile, in response to a tweet from the Atlanta Journal-Constitution, began to post pictures of their neighborhoods on Twitter -- many of which did not fit with Trump's characterization. Lewis, a leader in the civil rights movement of the 1960s who was beaten by state troopers during the "Bloody Sunday" march from Selma to Montgomery in Alabama, says in an NBC's "Meet the Press" to air Sunday that he does not consider Trump a "legitimate president," and blamed the Russians for helping the Republican win the White House. "You know, I believe in forgiveness. I believe in trying to work with people. It will be hard. It's going to be very difficult. I don't see this president-elect as a legitimate president," Lewis said. Trump, in followup tweet Saturday, said Lewis should spend more time helping his "crime invested" district, instead of "falsely complaining about the election results." "All talk, talk, talk -- no action or results. Sad." Trump concluded. Lewsi has said he will skip next week's inauguration of Trump at the Capitol, joining several other Democrats who have decided to boycott the historic event. The Lewis-Trump fued escalted on the eve of Martin Luther King Jr. Day. U.S. Intelligence agencies have said Russia meddled in the election to help Trump win. After spending weeks challenging that assessment, Trump finally accepted that the Russians were behind the election-year hacking of Democrats that roiled the White House race. However, he also emphasized that "there was absolutely no effect on the outcome of the election including the fact that there was no tampering whatsoever with voting machines." Lewis explained his decision to stay away from the inauguration as "you cannot be at home with something that you feel that is wrong, is not right." He said it will be the first inauguration he has missed in three decades, a time that includes Democrats and Republicans taking the oath of office. Other Democratic lawmakers who have announced plans to skip the inauguration include Reps. Barbara Lee of California, Earl Blumenauer of Oregon, Katherine Clark of Massachusetts and Luis Gutierrez of Illinois. They cite an array of reasons, but have one at least one thing in common. All represent heavily Democratic districts. On Friday, Representative John Lewis, Democrat of Georgia, declared that he did not view Donald J. Trump as a “legitimate president.” Mr. Lewis, an icon of the civil rights movement, said he planned to boycott the inauguration, the first he will skip in three decades. 0 Response to "Trump unleashes Twitter attack against civil rights legend"